Please forgive me, I am going to be snobbish for a second. Wisconsin, my dear beloved home-state, does not make very good chili. It’s sad but true. 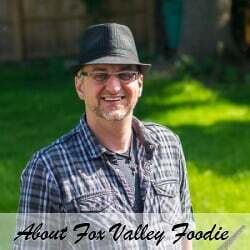 Visiting diners across the state I’ve most commonly been served what would best be described as a “chili soup” – a watery concoction, light on seasonings, fortified with beans, beef, noodles, and celery. Why celery? Dear Lord, I have no idea. I love you Wisconsin, but celery has no place in chili. 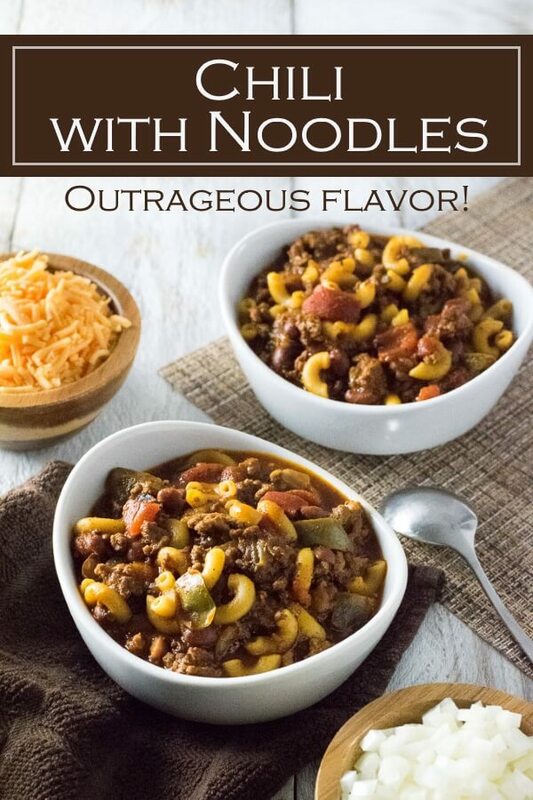 Well, I guess many would argue noodles don’t have any place in chili either – and I would tend to agree. However, I can at least understand why some would want noodles in chili. So for you, and everyone in the great state of Wisconsin, I devised a chili recipe with noodles – that honestly tastes good. Just a couple of quick disclaimers before we begin: Obviously I have not visited every diner and greasy spoon eatery in the state, I am sure some of them probably make fine chili. Also, if chili with noodles isn’t your thing, I recommend checking out my classic chili recipe, it is one of the best chili recipes online. 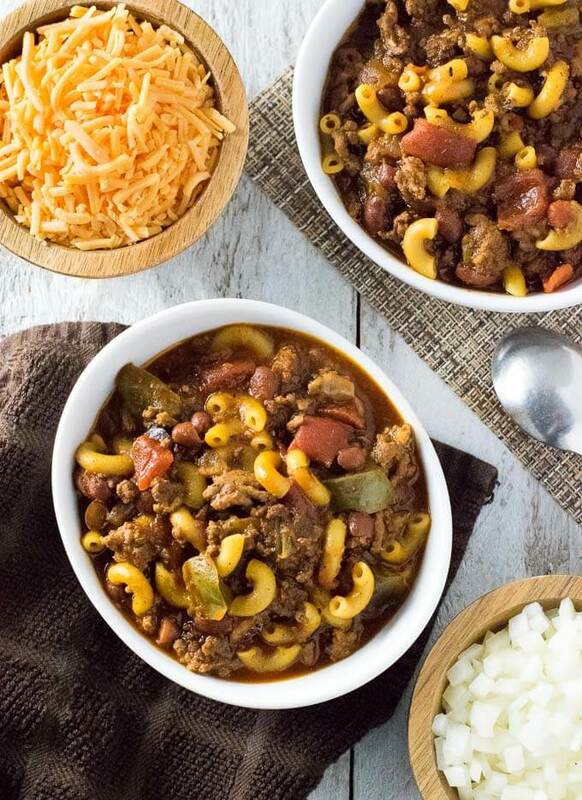 Most commonly macaroni noodles are used in chili unless you are making Cincinnati style chili, which features spaghetti noodles instead. The noodles can be prepared separately from the chili and mixed in when serving, or they can be cooked as the chili simmers. Is this dish chili mac? Though similar, this a traditional chili recipe that contains noodles. 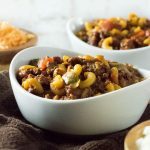 Chili mac is typically a simplified version of chili that has been adjusted for quick preparation with macaroni and cheese. 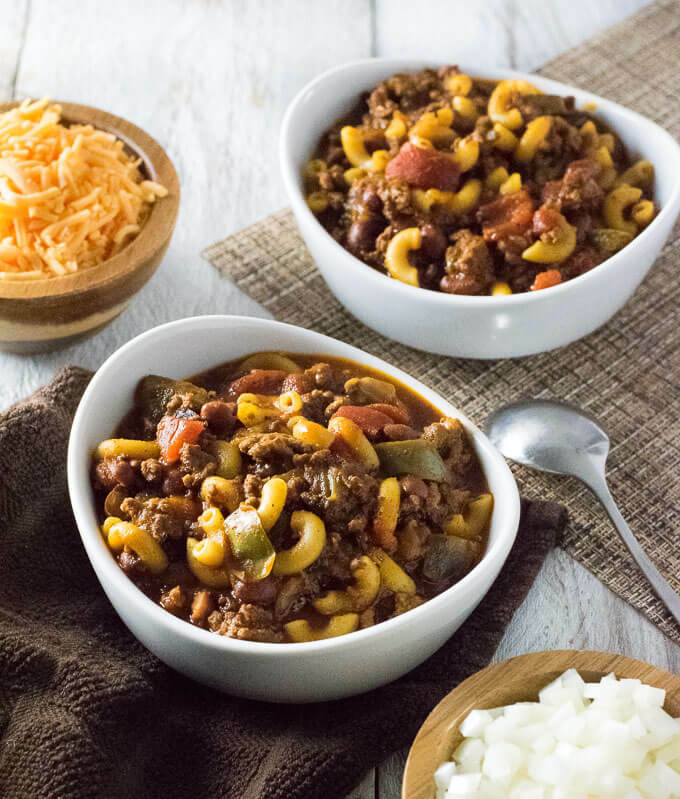 Think of this recipe as a more flavorful chili mac. Chili is a versatile dish that is most commonly served with ground beef as the main protein. However, turkey chili, chicken chili, or even venison chili are common variations. 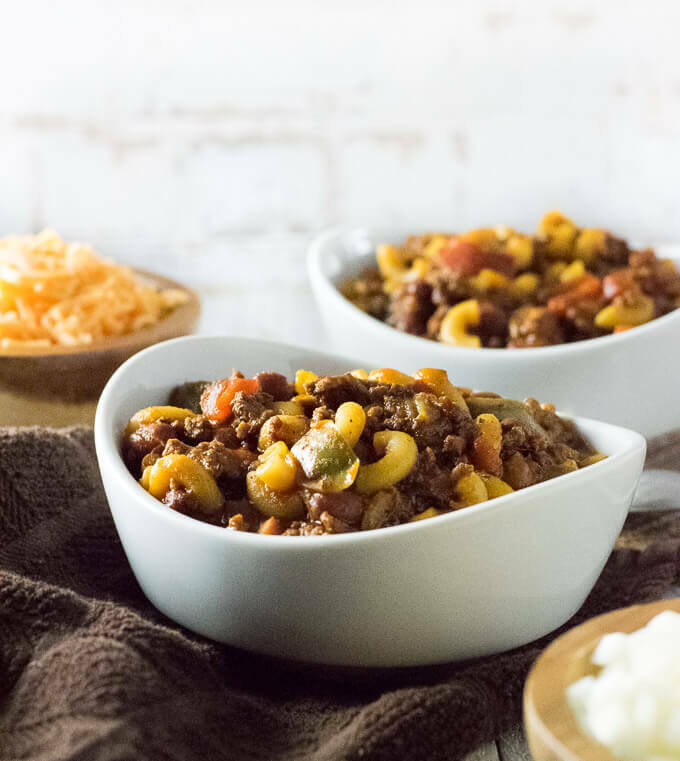 This chili with noodles recipe was designed for beef, however, you can substitute another ground meat if you choose and the recipe will still turn out great. I prefer to make chili in the Dutch Oven (affiliate link). It is great for browning the meat and sauteing the vegetables and its wide opening is ideal for the long simmer required to thicken the chili. Wider pot openings allow more liquid to evaporate. My recipe calls for cooking the chili for two hours to give the chili seasonings time to meld, however, you can simmer it longer if desired. Brown ground beef in Dutch oven or large pot over medium heat, then remove and set aside. Add chopped onions and peppers to the pot and saute until tender. Add garlic and cook for an additional 2 minutes. Return ground beef to the pot with sauteed vegetables and add chili seasonings and all remaining ingredients except macaroni noodles. Mix to combine. Simmer uncovered for 2 hours. Add macaroni noodles in the final 15 minutes of cooking. Serve with shredded cheddar cheese and sour cream for topping. I recommend serving this with Homemade Buttermilk Cornbread. This brings back memories of my mom making chili!